Winners have been emailed their Amazon Cards. If you won you got an email from Amazon with gift card money! Check your spam boxes if you see your name. I Won a $10 gift card from Amazon. Love it! I really enjoy these contests. Are the GC's just going to be emailed or will we be notified other then the winners list first ? Do we get an email if we won? I'm wondering if that MORGAN is me. Congrats to all winners. Thank you Night Owl Reviews for the gift card. Thank you so much for the GC!! On Nov 08, 2016, wcdixon said: Night Owl and Tammie.. The winners list will be on this page soon after the chat ends. :). On Nov 06, 2016, Calisa said: Hallowpaluza winners? Is there a list of winners? I can't seem to find out if I won anything and I had to work the night of the chat, so I missed it. On Nov 01, 2016, CrystalBee said: So many! There's a lot that's been added to my list, but I can't wait for Abbey Roads next book (even though it wasn't featured in the scavenger hunt). LOVED Race the Darkness! On Nov 01, 2016, SnowBearLake said: Winner? I hope to win one of these prizes. Finally got all of them done. I'm excited to read Black Diamond, it sounds really great and I love her writing. Race the Darkness is also one I'm excited for. Morgan Hannah MacDonald's Spirit of the Bayou will be on my to read lit. Ghosts and romance has to be a page turner. I am always searching for that elusive Highlander. I think Claimed by Highlander by Margaret Mallory will have to be read. Thank you, Tammie, for bringing all these great reads to u!! I am very interested in Changeling Moon and Dragon's Thief. I want to read Dragon’s Thief by Susan Lute and Surrender by Sarah Marsh. There are so many books I want to read. For instance, I'd love to read Trickery, Spirits of the Bayou, and with a Bone to name three.. I found several new authors that I want to check out. A few of them are Gaby Triana, Traci Douglass, Willa Blair, and Tory Richards. On Oct 31, 2016, ELF said: Dragon books! I was intrigued by the idea of "Dragon Knight's Ring" by Mary Morgan and "Dragon's Thief" by Susan Lute. Thanks for the fun giveaway and Happy Halloween to everyone! I'd like to read the books of Willa Blair and Hailey Edwards. I always love being able to discover new writers! Two new authors who I am excited to now read include C.C. Wood and Mika Jolie. I would also highly recommend Bobbie Groover's books! They are so well written and interesting. Augustina Van Hovan and Sarah Marsh. But there are several more that I would love to read their books. I'd like to read Night Visions by Sherrel Lee and Don't Wake the Dead by C.C. Wood. Yes the hunts are wonderful! THANK YOU TAMMIE for all you do for us! There are SO MANY I want to read hard to say just 2 .... Belle Chase by Suzanne Johnson and Black Diamond by Susannah Sandlin for starters. Happy Halloweenie Everyone!!! I am excited to read Bryce and His Mafia Princess!! This was so fun! So many possible new authors and books to choose- how do I pick two? Mika Jolie's Somewhere to Begin looks great and so does Claimed by Lee-Ann Wallace. Ravenna Tate's The Alpha's Taboo Mate & Tory Richards' Carmal Hunger. Thanks for the chance. Changeling Moon by Dani Harper and Down Will Come Tiger by Kat Simons are among some books that have caught my eye. I'Ed like to read Dani Harper and Revanna Tate. I think I would like to read Blood Bound by Traci Douglass since I noticed that Tule Publishing was the publisher and I am familiar with their books. Also Gunpoint, and Bad Girls plus a few more. Always a fun way to find new books and authors. Kat Simons and L.D. Rose are two new authors that I want to read. All of them! I like Gabi Triana and Susan Lute. I'd love to read Dog with a Bone by Hailey Edwards and Releasing the Demons by L.D. Rose. I also followed all of the Authors on Amazon. On Oct 29, 2016, Bube said: Super awesome Scavenger Hunt! This was so much fun and a great opportunity to have a look at some authors I hadn't seen before ... but I'm a sucker for dragons, so if I had to pick where to go first it would likely be Mary Morgan or Susan Lute. It'll doubtless get to a BUNCH of the others later. There were definitely more than 2 authors who snagged my attention/interest, but the top 2 were Kerry Schafer and April Zyon..!! Found several books I'd like to check out - Dead Before Dying by Kerry Schafer, The Eyes Die Last by Terri Riggs, Waiting for the Laird by Willa Blair, The Keeper by Rebecca E. Neely, Black Diamond by Susannah Sandlin and I've just purchased The Thorn of a Rose by Augustina Van Hoven. Thank you for introducing me to new authors and books. There are so many books I added to my list. Here are two of the ones I can't wait to read, His Mafia Princess by April Zyon and Surrender by Sarah Marsh. Thank you for the chance to win a great prize too. On Oct 28, 2016, Enigma said: Thanks for an awesome give away. Mafia Queen & Leaf's Gunpoint. Sound good to me. On Oct 28, 2016, thewildtwo said: So much fun as usual! I'm excited about Teri Riggs and Abbie Roads. On Oct 27, 2016, proudarmymom said: Yay for new to me authors!!! I would love to read Abbie Roads and Morgan Hannah MacDonald. So many great authors, as usual. You ladies rock, always putting together such a great event. On Oct 26, 2016, carmen said: Thank you! I already bought What the Duke Wants by Amy Quinton and would love Erin M. Leaf's Gunpoint and Aidee Ladnier's The Moonlight Market. Thanks for the contest! Would like to read "Claimed by a Highlander" by Margaret Mallory, Changeling Moon by Dani Harper!! my favorite genres (historical and paranormal). I would love to read stories by Kat Simons, and Lee-Ann Wallace. I'm interested in Erin M. Leaf's Gunpoint and Aidee Ladnier's The Moonlight Market. Tried to enter Edgar Allen Poe as favorite coloring book today but it closed up before I finished. These hunts are always fun. While looking for the words you always see a book or 10 that grabs your attention. From there you find new authors. This is a great way to help us readers do just that. Makes it so easy. Thank you. Thanks for the chance at this amazing giveaway. The two books I'm really excited about, we'll this was hard but I had to choose just 2 so I'll go with Night Visions by Shearer Lee and Bad Girls by Vanessa Liebe. (Truly there's so many I will be reading. I would love to read Gunpoint by Erin M. Leaf and The Alpha's Taboo Mate by Ravenna Tate. There look to be a lot of great books this year. I'm completely intrigued with Gunpoint by Erin Leaf and Dont Wake the Dead by C.C. Wood. A couple of new authors that I found was Margaret Mallory and Sharon Buchbinder. On Oct 24, 2016, Kittybooboo13 said: I love the Hunt, and I love looking for new authors! I think the two new authors I saw these last few days are: Sabrina York and Sam Cheevers. They're books look interesting and I'm always game to find new authors to read! I love doing this hunt! It's always fun! This time around I found books by Elle Boon, Sam Cheever & Tory Richards. I downloaded The Evans Brothers Trilogy by Tory which caught my eye. I also picked up the latest HoneyBun Saga. Looking forward to some great reading. On Oct 24, 2016, wyndwhisper said: Love all of the books! Thanks for the great contest. and Happy Halloween! Erin M. Leaf, L.D. Rose, Aidee Lodnier are just a few new to me authors I found :) Thank you for the easy to use links for adding to my wish list and to see all of the other books. I'd love to try Teri Riggs and Hailey Edwards. On Oct 22, 2016, davisbk said: This is a fun way to learn about new authors and books. I've already purchased Waiting for the Laird by Wila Blair, Dragon Knight's Ring by Mary Morgan, and Claimed by the Highlander by Margaret Mallory. Now, I would like to read Trickery by Sabrina York, and What the Duke Wants by Amy Quinton. Plus, I found three new coloring books, and some new authors that I'm going to check out. I want to read Ella Boon and Catherine Bruns. Thanks for a great scavenger hunt. Found some new things to read. On Oct 21, 2016, adila said: Want all the coloring vBooks! As a huge historical romance fan, I'd like to get "Claimed by a Highlander" by Margaret Mallory & "Waiting for the Laird" by Willa Blair. However you "killed" me with the coloring books. I'd to pick one, so I picked the most unusual, but I want them all. On Oct 21, 2016, TrinaC said: Love!! There were a lot of authors I want to check out. Looking forward to reading Margaret Malloy & Suzanne Johnson. On Oct 21, 2016, SandyH said: so many books! Ii'd like to read :"Charmed by a highlander" By Margaret Mallory, "What the duke wants" by Amy Quinton, and "Serendipity of fate" by Becky Banks. All new authors to me in 2 of the genres I like to read! Thanks! So many new authors and books .. going to check out Elle Boon & Suzanne Johnson.. Awesome Giveawway ! So many good books. I am excited to read His Mafia Princess and what the Duke Wants! On Oct 20, 2016, amandastar said: Thank you! I'm looking forward to reading Night Visions by Sherrel Lee and His Mafia Princess by April Zyon! On Oct 20, 2016, pharmnut said: Books i want to read! Kiss of the Silver Wolf, Carnal Hunger, What the Duke Wants, and Fallenwood. Ty for the chance ?? There was definitely a few Authors I found but two were Ellie Boon and Leslie-Ann Wallace. I'm going to be checking out Margaret Mallory and Hailey Edwards books! I'd like to read Belle Chase by Suzanne Johnson and Spirits of the Bayou by Morgan Hannah MacDonald. Belle Chase by Suzanne Johnson, Black Diamond by Susannah Sandlin & Gunpoint by Erin M. Leaf. I'm adding Silver Wolf by Sharon Buchbinder and Trickery by Sabrina York to my wishlist! I really love this. I discover several new authors and books to read like. So many fantastic books! I am especially interested in Black Diamond by Susannah Sandlin, Belle Chasse by Suzanne Johnson, and Dog With a Bone by Hailey Edwards. 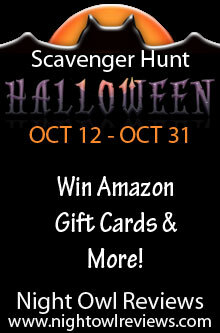 Thanks for sponsoring this great Halloween Scavenger Hunt. Two books that look great to read are Dragon's Thief by Susan Lute and Dog with a Bone by Hailey Edwards! Thanks for this amazing contest - I would love to win! Two books I'm excited about is Trickery and His Mafia Princess. Thanks for the giveaway. Lots of books added to my wishlist! I'm exited about two books for sure! I'd like to read Serendipity of Fate by Becky Banks and Gunpoint by Erin M. Leaf. Thank you for offering these contests to find new authors and get a chance to enter the giveaways! On Oct 17, 2016, DragonStar said: Holloween Book Hunting! I so Love these hunts! I find so many new to me writers to save up for to read. and those are just to name a few that I'm looking forward to getting. Thanks again for a good time. On Oct 17, 2016, Bookfreak said: OMG yes! I really love these things. I alwys discover some new authors to read like Aidee Ladnier or Margaret Mallory. Surrender by Sarah Marsh and Kiss of the Silver Wolf by Sharon Buchbinder. Claimed by the Highlander by Margaret Mallory and The Revenge Artist by Philip Hoy. I can't wait to read Race the Darkness by Annie Roads and The Alpha's Taboo Mate by Ravens Tate, they both are great authors . On Oct 17, 2016, melissaq said: Thanks for the chance! I'm excited to read His Mafia Princess by April Zyon and Changeling Moon by Dani Harper!! Two of my favorites are Serendipity of Fate by Becky Banks and Claimed by a Highlander by Margaret Mallory. Claimed by the Highlander by Margaret Mallory, and The Revenge Artist by Philip Hoy are two books I would like to read. abbie roads, catherine bruns, bobbi groover, kerry schafer and mary morgan - from cozy mystery to sweet romance - hope to be able to get some of these books soon. I found many books to add to my list including Stumptown Spirits by E.J. Russell and The Inn at Little Bend by Bobbi Groover. I found many more besides these. I can't wait to read Black Diamond by Susannah Sandlin, Claimed by Lee-Ann Wallace, Race the Darkness by Abbie Roads, and Bryce by Jessica E. Subject. I have found quite a few books I definitely want to read . Thanks for the chance. On Oct 15, 2016, booksforme said: So many great books!! I can't wait to read-All Hallows' Eve by Annabelle Jacobs. On Oct 15, 2016, Amystw said: So many great books! There are so many great books. The two books I would choose are Gunpoint by Erin M. Leaf and Don't Wake the Dead by C.C. Wood. Sabrina York and April Zyon. Bryce and Fallenwood are two of many books new to me that I would like to read. Wake the Hollow and Firebolt. Dragons always get me in! I would like to read Miss Van Hoven's book The Thorn Of A Rose and Black Diamond by Suzannah Sandlin. to read Trickery by Sabrina York and What the Duke wants by Amy Quinton. I look forward to reading Sabrina York's newest and Dani Harper's nest stories. I already read Trickery by Sabrina York. Added several books to my Amazon wish list, including Dead Before Dying by Kerry Schafer, The Holiday Spirit by Dani Harper, and Holiday Hearts Awakening by Fiola Faelan. I have also been a fan of Susan Lute for many years. Great Authors on here Sabrina York and Elle Boon, Found a lot added books and bought couple..
Lisa Dawn., E.J. Russell , Dani Harper.. Thank you for the Great Contest and introducing New Authors.. I will be reading Race the Darkness by Abbie Roads. Claimed by a Highlandereal by Margaret Mallory. Waiting for the Laird by Willa Blair. Thanks for another fun giveaway. I found several new books that I want to read. On Oct 14, 2016, Vrogers said: Giveaway! Two new authors I found were Sherrell Lee and Traci Douglass. Thanks for the chance! Thanks for the opportunity! I had a lot of fun! What a great way to promote books & authors. On Oct 14, 2016, starsunraveling said: Thanks for the awesome giveaway!!! Awesome contest and some new to me authors. Don't Wake the Dead, Time in Draig and Somewhere to Begin are my top must look into's ...thank you for the chance and turning us on to some new reads. I usually stick with the Romance genre so I think the 2 I would pick would be Holiday Hearts Awakening by Fiola Faelan and Serendipity of Fate by Becky Banks. I found SIX I want to check out! Found Kat Simons and Catherine Bruns....so cool. Woohoo!!! If I have to pick only two they would be C.C. Wood and Teri Riggs. Traci Douglass and Sarah Marsh; thanks for the giveaway! I'm interested in What the Duke Wants by Amy Quinton and Claimed by a Highlander by Margaret Mallory. I am excited to read What the Duke Wants by Amy Quinton, Kiss of the Silver Wolf by Sharon Buchbinder, Claimed by a Highlander by Margaret Mallory, and Trickery by Sabrina York. How could anyone pick just a couple? This list represents talented authors, from your first choice of Sherrel Lee all the way down the list to Gabby Triana. All these author offer great reads so, *sheesh*, asking us to pick just a few is like only offering one piece of chocolate to a woman going through PMS. Not very nice, Night Owl. Mika Jolie and Amy Quinton. On Oct 13, 2016, marybelle said: Thank you!! WAITING FOR THE LAIRD tops my list, but so many great books made my wish list. On Oct 13, 2016, MorganVL said: Happy Halloween! Claimed By A Highlander by Margaret Mallory, Trickery by Sabrina York and several others. I am really excited by a few of the authors but the two that stand out the most to me are Traci Douglass and Tory Richards. Can't wait to read both. I enjoyed Wake the Hollow. I'm really excited to continue the Orleans Sentinels series. I'm interested in Firebolt because dragons!! Somewhere to Begin and Dog with a Bone sound interesting and the covers are pretty. I would love to read Trickery by Sabrina York and Claimed By A Highlander be Margaret Mallory. Thanks for the awesome giveaway!! ?????? On Oct 13, 2016, Sylvie said: So Much Fun! So many intriguing titles here! I'm especially interested in Black Diamond by Susannah Sandlin, Don't Wake the Dead by C.C. Wood, Ghostly Persuasions by Dena Garson and Gunpoint by Erin M. Leaf. Thank you!! Thanks for this GreatReadHunt. I had fun doing it and found several authors that I will further research. Two of them are Amy Quinton and Susan Lute. On Oct 13, 2016, Lira said: Wooo! I'm really looking forward to Dragon Knight's Ring by Mary Morgan and Kiss of the Silver Wolf by Sharon Buchbinder! What the Duke wants and waiting on the laird will be in my TBR pile soon. Down will Come Tiger by Kat Simons and Ghostly Persuasion by Dena Garson to start, and I will work my way through more! On Oct 13, 2016, ktandcamsmom said: Love these scavenger hunts! I gained so many new books and authors I can't pick just one! I'm looking forward to reading Serendipity of Fate by Becky Banks and Burned to a Crisp by Catherine Bruns. THANKFUL FOR THIS GIVEAWAY AND TO MEET SO MANY NEW AUTHORS. I would like to read Claimed By a Highlander by Margaret Mallory as well as a few others. On Oct 13, 2016, ElizabethH said: Scavenger Hunt! I've been hearing great things about RACE THE DARKNESS by Abbie Roads. SPIRITS OF THE BAYOU by Morgan Hannah MacDonald sounds really good! There are so many wonderful new authors and books! And of course I love anything by Jessica E. Subject! Thanks for the scavenger hunt! Several of these authors and their books will now be on my to read lists but two of the ones who stand out are Dani Harper and Ravenna Tate. A great way to meet new authors. Found a few new authors I'm going to try out. Loving those shifter books. I want to read Aidee Ladnier's MOONLIGHT MARKET, SURRENDER by Sarah Marsh, STMPTOWN SPIRITS by E.J. Russell, and CRASH LANDING by Jessica E. Subject. I am looking forward to read Susan Lute's books and April Zyon's books.. I have not read any of their books. Thank you for the contest and the chance to win. NIGHTOWL HAS THE BEST AUTHORS. I have Dead Before Dying by Kerry Schafer and Punishment Summer by Peggy Rothschild on my TBR list. Those are the two main ones, but there are many,many more!!!! I love this Hunt every year!!! I just finished reading EJ Russell's latest book Wolf's Clothing and really looking forward to more of her writing. My other find is Abbie Roads's Race the Darkness, and can't wait to grab the next book. Thank you for the chance at the giveaways. This is such a fun event! On Oct 12, 2016, QueenieT said: Thanks! Trickery by Sabrina York and Race the Darkness by Abbie Roads! On Oct 12, 2016, Beckworth said: Great! I so want to read the books by Dani Harper and Sam Cheever! Thanks readers for finding that we were missing a word on Traci Douglass page. The graphic is now up. Happy Hunting. On Oct 12, 2016, socialjsmith said: Two things. Hmm. Off-hand, I would like a "Jane Austen" coloring book, and "The Revenge Artist" by Philip Hoy looks relatively sophisticated. Surrender by Sarah Marsh and Slaters Enchanted Mate by Elle Boon thank you for the chance! I'd love to read books by Mika Jolie and Fiola Faelan, thanks for the giveaway! On Oct 12, 2016, momofsteele said: Scavenger hunt! Wake The Hollow by Gabby Triana and Dragon's Thief by Susan Lute are two books I've added to my tbr! On Oct 12, 2016, Lindsey said: Lindsey V.
On Oct 12, 2016, Angieia said: Two new Halloween books! I found two books that I am excited to read Trickery by Sabrina York and What the Duke Wants by Amy Quinton. I would love to read Claimed by a Highlander by Margaret Mallory, What the Duke Wants by Amy Quinton, and Dragon Knight's Ring by Mary Morgan. Without a doubt since it is Halloween time I would love to read Don't Wake the Dead by C.C. Wood and Stumptown Spirits by E. J. Russell. Boo! I'd like to read books by Vanessa Liebe and Sabrina York, and a big bunch of others! Ellen Boone and Sabin York.I'm excited to try all the new authors though. On Oct 12, 2016, petuniag said: Thank you Tami for all you do for us! I'm interested in reading Catherine Bruns and Sabrina York's books. Kerry schafer and Dena Garson as well as Teri Riggs. Love this contest! Traci Douglass's page has no word. I would like to read Ghostly Persuasion by Dena Garson, The Challenge by Teri Riggs and Burned to a Crisp by Catherine Bruns. So many good authors and books on this hunt!! A few of the ones that caught my attention were Burned to a Crisp, Changeling Moon, Don't Wake the Dead and The Keeper. Thanks for such a fun giveaway!! On Oct 12, 2016, Popi D said: Amazing hunt!! ~Blood Bound by Traci Douglass. Love this idea for a contest! I want to read all the authors listed in this giveaway. I am interested in all of them but this one caught my eye: Firebolt (The Dragonian Series Book 1) by Adrienne Woods................And I noticed the same thing Traci Douglas didn't have a Halloween word. And there is problem with visiting Traci Douglass NOR Author Page, there is no "Halloween Item Word(s)" to be found anywhere. On Oct 12, 2016, MdotDrizzi said: Great Hunt! I am most looking forward to reading Time of the Draig by Lisa Dawn Wadler and Wake the Hollow by Gaby Triana. Two very intriguing books!